Your Wedding specialist, Large or Small we setup what you need. Concert, Bands, Live Performances, Sound Techs. We are here to support you. Dances, Fundraiser, Community Events we will do our best to help. Photo Booth packages available with or with out DJ services. Professional DJ/MC for Sudbury, Espanola, North Bay, and surrounding areas. Providing DJ services for weddings, anniversaries, corporate parties and much more. In operation since the turn of the century. Full sound and lighting for all kinds of dance and party styles. We can really make your event one to remember. Photo Booth now available with our DJ service – it is lots of fun for you and all your guests. 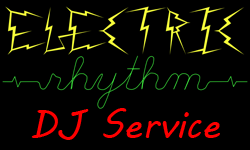 Thank you in advance for considering Electric Rhythm for all your party needs. We look forward to making it a memorable event.